I recently read The Beginning of Everything by Robyn Schneider. I had heard some great things about it from many of my friends, so I finally got a hold of a copy and was thrilled to read it, only to have it strike some déjà vu in my mind. The Beginning of Everything focuses on the ideal that everyone has a tragedy, which marks the starting point of all of the important events in a person’s life. A reckless driver shatters tennis jock Ezra Faulkner’s knee, ruining his athletic career. This has Ezra rethinking the quality of his friend group when they don’t visit him in the hospital all summer. Come senior year of high school, Ezra finds himself reconnecting with old friend Toby Ellicott and fancying new girl Cassidy Thorpe. The book follows Ezra and his newfound relationships throughout the school year. While reading The Beginning of Everything, I couldn’t help but feel as if I was reading Paper Towns by John Green again. From the very beginning of the books, I started realizing the similarities. 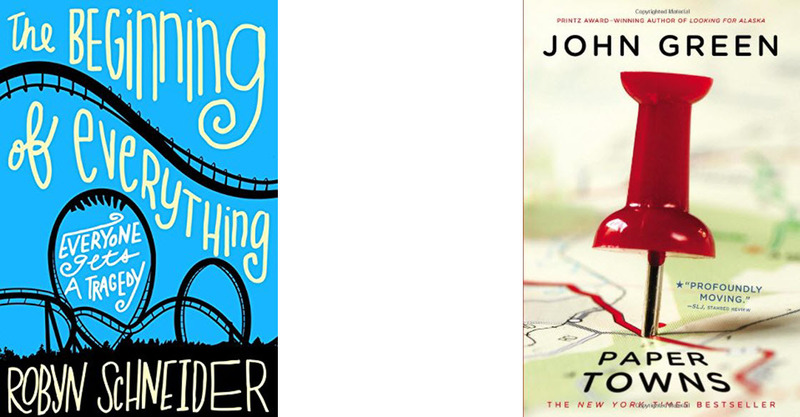 The first line of Paper Towns is “The way I figure it, everyone gets a miracle.” and the first line of The Beginning of Everything is “Sometimes I think that everyone has a tragedy waiting for them…” Both books start out with a boy in his senior year of high school making a generalization about what everyone receives in their lives. This makes both boys seem like intelligent kids who have loved and lost and are wiser because of it. The people that surround these similar boys are also very much alike. The friends of the main characters are sort of the misfits of their class. They aren’t the coolest kids in the school, but know how to have fun from various parties in Paper Towns to Speech and Debate parties in The Beginning of Everything. Lastly, the love interests of the main boys have spitting image personalities, and are who actually drew my attention to how alike the books are. Neither of them are just normal girls; they love living outside the box and taking the protagonists with them. They are both mysteries to all of the kids at school and both decide to go missing for a while. There are other big similarities I won’t include in case they are spoilers! I would recommend reading The Beginning of Everything to anyone who really enjoyed Paper Towns. It has the same high school humor as Paper Towns, making it a fun read. Unfortunately, I really disliked the main girl (Margo) from Paper Towns, which made me dislike the main girl (Cassidy) in The Beginning of Everything. If I had read the latter first, I probably would have been more fond of her. It does get distracting at times how similar it is to Paper Towns, but altogether The Beginning of Everything a fairly good read.